The Children’s and Women’s Hospitals Replacement Project will create a new, state-of-the-art inpatient facility for children and women, and also provide shelled space for flexibility and expansion opportunities in the future. 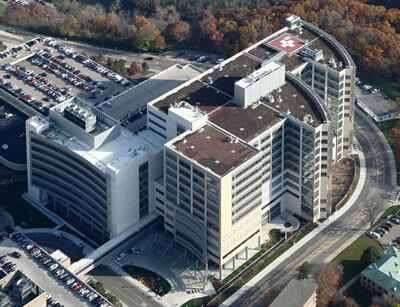 Consolidating pediatric care into one location also creates opportunities to renovate existing spaces for expansion of University Hospital adult services, which cannot meet current demand due to physical capacity constraints. The facility will be approximately 1.1 million gross square feet and consist of a clinic building of 9 floors and an inpatient building of 12 floors plus penthouses for mechanical equipment. The distinctive and prominent building hosts wide spans of glass to allow natural daylighting as well as views to nature due to its location across from the University of Michigan’s Nichols Arboretum. The design incorporates colors and materials that gesture to the existing campus while incorporating curved forms and building insets that relate to the Arboretum – humanizing the scale of the hospital. Varying colors and forms help define the building’s components and functions. Inside, the environment is playful and inviting for children as well as sophisticated and meaningful for women. A skylit canopy greets guests while a two-story lobby and waiting area – overlooking dramatic outdoor courtyards – creates an inviting entry into the facility. A front and back of the house distinguishes public, service, and patient spaces vertically by floor and horizontally with behind-the-scene spaces. Construction completed November 2011. Building occupied December 2011.